Announcement Spring has sprung SALE!! All Comfort Colors long sleeve shirts are 10% off through April! Hey there and welcome to Buckstones Buckles and Thangs! We offer handmade southern, faith based and boho inspired jewelry, hand stamped jewelry, custom belt buckles, apparel, headbands and accessories. Please follow me @buckstones & like us on Facebook: Buckstone's Buckles and Thangs. Thanks for stopping by and come back and see us soon! Spring has sprung SALE!! All Comfort Colors long sleeve shirts are 10% off through April! Hey there and welcome to Buckstones Buckles and Thangs! We offer handmade southern, faith based and boho inspired jewelry, hand stamped jewelry, custom belt buckles, apparel, headbands and accessories. Please follow me @buckstones & like us on Facebook: Buckstone's Buckles and Thangs. Thanks for stopping by and come back and see us soon! Hand Knotted Jade, Red Coral and Black Lava Rock leather tassel boho necklac. Xlarge Women's Christian T-Shirt " It is well with my soul" long sleeve t-shirt. 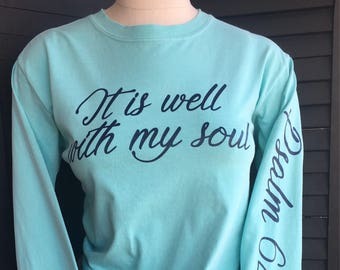 Large Women's Christian T-Shirt " It is well with my soul" long sleeve t-shirt. Medium Women's Christian T-Shirt " It is well with my soul" long sleeve t-shirt. 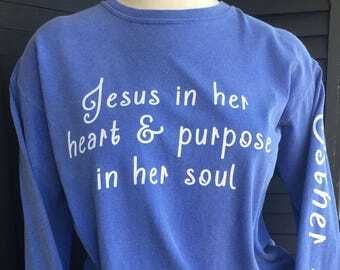 Small Women's Christian T-Shirt " It is well with my soul" long sleeve t-shirt. Medium Southern sassy themed sweatshirt. "Hot Southern Mess" women's super plush fleece slouchy style sweatshirt in super soft fleece. Medium super soft and plush women's dog lover sweatshirt features a wide neck and an off the shoulder relaxed fit. Small super soft and plush women's dog lover sweatshirt features a wide neck and an off the shoulder relaxed fit. X-Large Southern inspired hunting outdoors country girl Comfort Colors Long Sleeve Shirt in Ball Cap & Muddy Boots. Large Southern prep inspired hunting outdoors country girl Comfort Colors Long Sleeve Shirt in Ball Cap & Muddy Boots. Small Southern inspired hunting outdoors country girl Comfort Colors Long Sleeve Shirt in Ball Cap & Muddy Boots. Beautiful ! Will be perfect for my barn church wedding! Great purchase. My daughters loved them! Super comfy and very nice quality. Melissa was incredible to work with. Check out our new Southern inspired sweatshirts that will be sure to keep you warm and look cute too! 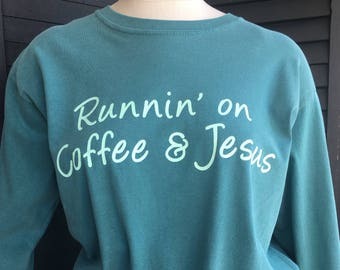 Medium super soft and plush women's Southern Sweet tea & Jesus sweatshirt features a wide neck and a shrug relaxed fit. Hey there! I’m Melissa, the designer and owner of Buckstone’s Buckles and Thangs. I’m a small town girl who is a wife and “mama” to two amazing kiddos and two adorable four legged monsters, Buck and Stoney, who I lovingly named my business after:) I have an immense love for God, my family and friends, the outdoors, nature, animals, chocolate and creating beautiful things! I started on this journey a few years ago really quite by accident when a girlfriend and I were taking our kids to a Taylor Swift concert and needed to repair and re-bead an old belt buckle that I wanted to wear that evening. Before I could even realize what was stirring inside of me, I was hooked and became immersed in the creation of making buckles. I have always been a crafty girl who is self-taught and very persistent when I set my mind on learning how to do something. Although my hubby would probably describe those qualities in me as stubborn and a little bit of a control freak, it has and often does serve me well. My inspirations very often come from my quiet time with God and when I’m in the great outdoors clearing my mind. I’m a very high energy gal that rarely slows down (I really do think I run in my sleep) so I require decompressing from time to time. When I started this business it was two- fold and purposeful in what I envisioned big picture. First and foremost, I wanted to give back and make a positive contribution to the world around me in some way. Because of that, we give back a portion of the proceeds to charities that are near and dear to us. I believe that God gives us all gifts and those gifts are to be shared with others to bless them. I didn't know what that would look like or how I could make a difference in my little corner of the world but I am thankful for the way in which it has evolved and how I've grown in my own faith and strength in the process. My family is very much a part of my business and I love that they each are in their own way a part of it and what I love to do. They give me great support and encouragement and are quite patient with me and how I completely throw myself in to projects. What started out as a corner of a room in the basement as work space, has grown to pretty much the whole house or wherever I decide to land It’s rare that you will not step, sit or get poked by either a needle, bead or something sharp in our home from my little “projects” that seemed to be scattered around the house. I put my heart and soul in to everything I do and create and I hope it shows. I’m a perfectionist at heart and take great pride and care in what I produce and put out there. You will see that in my work and I will not make or sell anything that is not made of the best of quality materials and workmanship. My style is very simple, country, southern, boho and organic by nature. My ideas and creations are often fluid and I am known to just sit down with materials and just let the creative juices flow and see where I am led and what comes out of it. By nature, I am a color outside of the lines kind of girl and that tends to be how I create and learn the best. I love nature, being in the woods, the lake and the raw materials and the beautiful colors that are a part of it and what brings calmness to my soul. You will see that in a lot of my work and products that I produce. My goal is to offer beautiful, one of a kind, quality accessories and apparel that you will love wearing or giving. But, bigger than that, I hope that the love and passion that lives inside of me and what I do is felt whether you’re wearing one of my creations or giving it as a gift. Thank you for being a part of my journey and I wish you many blessings, purpose, love and adventure in yours! I'm a wife, mom and a small town girl who loves the outdoors and the country. I have a passion for creating and making beautiful, quality and unique accessories and apparel. I make custom boho- inspired jewelry, custom belt buckles and headbands. Screensmith is a family owned and operated screen printing business located in Alpharetta, Ga. Rick is my go to guy who is not only reliable, professional and super sweet but he does fantastic work and always takes exceptional care of me. I stand behind my craftsmanship and quality of materials that I offer. I want every one of my customers to love their products as much as I have loved making them. I take great pride in what I do and what I produce. As a general rule, I offer store credit and exchanges only within five business days of the purchase. I will make every reasonable accommodation necessary to bring customer satisfaction. In the rare case that a refund is requested, please message me within five business days of receiving your item to discuss the situation. At that time, it will be determined if an exchange or refund is suitable and/or warranted. This will be determined on a case by case basis and in writing. Please note that sizes and lengths are clearly noted on the descriptions. Please measure and order accordingly. If a piece needs to be made larger and reworked, that's not a problem . However, a minimum fee may be applicable for the additional materials needed to accommodate for the size difference. Any item whether exchanged or refunded must be in its original state that I sold it in: new, unworn and undamaged. I accept credit cards through the Paypal system. I ship all in stock items within 1-3 days through USPS either by First Class or Priority mail with tracking. I know what it's like to have to wait for that package to come and do my very best to get it out that very day! I LOVE custom orders and take them regularly. This requires a lot of communication between us to make sure that we are on the same page and that your vision is coming to fruition. Please message me to discuss the specifics. Payment: 50% is required upon acceptance of the piece with the balance being done prior to shipping. All sales are final with custom orders.